Wound care expert Joel Beam will discuss community associated MRSA, or methicillin-resistant Staphylococcus aureus, in conjunction with the University Speakers Series on Nov. 8 at 7 p.m. in Indiana State University's Hulman Memorial Student Union, Dede I.
MRSA has been making headlines for the last decade in professional athletics, collegiate and high school teams, as well as in the community, where perceived epidemics have required CDC evaluation and clean-up to stop the spread of the condition. Infections are spread through close skin-to-skin contact, skin wounds, such as cuts and scrapes, crowded living conditions, and poor hygiene. Beam's presentation is in conjunction with the Department of Applied Medicine and Rehabilitation Speaker Series. 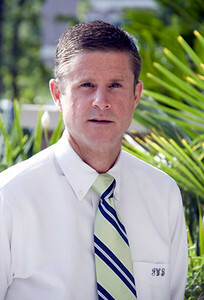 Beam earned his bachelor's degree from East Carolina University, a Master of Education degree from Clemson University, and a doctorate in education from the University of North Florida. He was a graduate assistant athletic trainer at the University of Florida and Clemson University prior to becoming an assistant athletic trainer and adjunct instructor at the University of Miami. Beam then served as the head athletic trainer and adjunct instructor at the University of North Florida. He is currently an associate professor and director of the Athletic Training Education Program at the University of North Florida. He is a reviewer for numerous publishers, journals, and grant programs and serves as an expert peer referee with the Cochrane Collaboration Wounds Group. He has authored publications at the national and international levels and the textbook "Orthopedic Taping, Wrapping, Bracing, and Padding." Beam's primary area of research is the effectiveness of semi-occlusive and occlusive dressings on healing rates of abrasions. Wound care expert Joel Beam will discuss community associated MRSA, or methicillin-resistant Staphylococcus aureus, in conjunction with the University Speakers Series on Nov. 8 in Indiana State University's Hulman Memorial Student Union, Dede I.